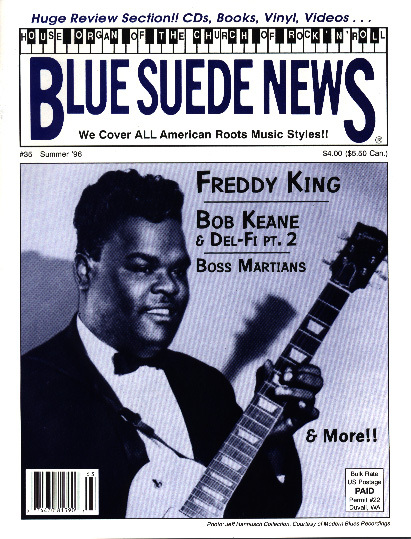 Blue Suede New #35: Freddie King, Bob Keane, Ritchie Valens, Bobby Fuller, Boss Martians, Arch Hall, Danny Gatton, Rockabilly, Blues, '50s Rock'n'Roll! Issue #35 - Summer 1996 - Scroll down to order!! Blue Suede News #35 (Summer 1996) has 68 pages with a slick cover. On the cover is blues giant Freddy King, one of the most influential blues guitarists ever. The story is titled Freddy (or is it Freddie) King singing and playing those Texas blues. There is also a story about Bob Keane, owner of Del-Fi Records who discovered and scored hits with Ritchie Valens. He also recorded Johnny Crawford and The Bobby Fuller Four. Very interesting story. Surf and instro rock band the Boss Martians are interviewed and there is a story about a lost Rockabilly legend: Phil Ryan Osborne. Another feature is an article on Arch Hall Sr. and Jr., Jr. starred in early '60s B-movies like The choppers, Sr. produced Wild Guitar and other cult flicks. Also there a report about a memorial show for guitar legend Danny Gatton titled Sun Greats come out for Danny Gatton. A photo page has pictures of Larry and Lorrie Collins (The Collins Kids) and Rockabilly and western bop masters Dave & Deke.